In 1895, Aldred Warthin, M.D., a pathologist with a keen interest in patients, and a good listener, noted that his seamstress appeared to be depressed. He pursued this in detail, and she told him it was because she believed she would die of cancer at an early age, since everyone in her family seemed to succumb to cancer of the colon or female organs. Just as she predicted, she developed endometrial cancer and died of that disease. This brief background piqued Warthin’s interest and he developed her pedigree and many others. In a remarkably similar scenario, Henry Lynch, M.D., in 1962, while a first year internal medicine resident, was called to see a patient who was recovering from the delirium tremens. In a statement similar to that of Warthin’s seamstress, the patient stated that he drank because he knew he would die of cancer since everyone in the family died of colorectal cancer. Lynch, assuming that he was dealing with familial adenomatous polyposis, developed the pedigree only to find that the colon cancers were occurring in the absence of multiple colonic adenomas. Other cancers, particularly the endometrium and ovary, occurred throughout the extended family, showing a pattern consonant with an autosomal dominant mode of genetic transmission. The syndrome in the family, along with a strikingly similar family, were published in the Archives of Internal Medicine in 1966. 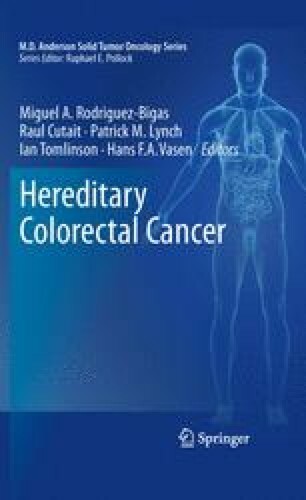 Since that report, many hundreds of hereditary cancer-prone families with the same patterns of cancer occurrences, now known as Lynch syndrome, have been identified throughout the world, and it is now the undisputed most common hereditary form of colorectal cancer. History shows that these discoveries were products of collecting detailed family histories and innovative reasoning concerning their clinical significance. This manuscript will show the historical development of our understanding about the importance of a comprehensive cancer family history involving cancer of all anatomic sites, genetic counseling, and DNA testing when indicated. The fervent hope continues that these practices will significantly reduce cancer’s morbidity and mortality in the Lynch syndrome. This chapter was supported by revenue from Nebraska cigarette taxes awarded to Creighton University by the Nebraska Department of Health and Human Services. Its contents are solely the responsibility of the authors and do not necessarily represent the official views of the State of Nebraska or the Nebraska Department of Health and Human Services. Support was also given by the National Institutes of Health through grant #1U01 CA 86389. Dr. Henry Lynch’s work is partially funded through the Charles F. and Mary C. Heider Chair in Cancer Research, which he holds at Creighton University.